The life of Marguerite d’Youville (1701-1771) was one of sorrow and disappointment. A girl from a genteel but impoverished Montreal family, Marguerite experienced childhood poverty, an embarrassing marriage and the deaths of her husband and four of her six children. Through all of her sufferings, Marguerite felt God’s presence in her life. She committed herself to a life of charity and service to the poor, the ill and the elderly. 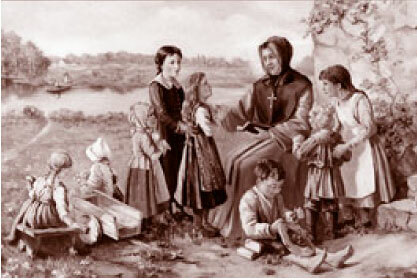 Marguerite’s deep spirituality, unwavering belief in Divine Providence and selfless works of mercy attracted other women to join her and in 1737, they consecrated themselves to God and established the Congregation of the Sisters of Charity. Marguerite broke with the social conventions of her time and continually fought for the rights of the most marginalized members of society. Her charism has transcended time, place and culture for almost 300 years and thousands of women—Grey Nuns—have dedicated themselves, in Jesus’ name, in service to others all over the world. 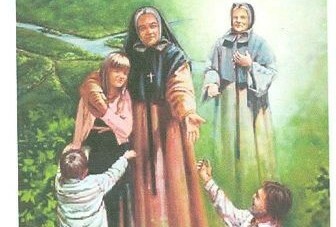 At her beatification in 1959, Pope John XXIII gave Marguerite d’Youville the title of “Mother of Universal Charity.” In 1990, she was canonized as the first Canadian-born saint by Pope John Paul II. Today, Grey Nuns can be found all over the world, continuing the legacy of love, compassion and service of Saint Marguerite d’Youville.